If you’re a regular follower of Magdalena Tarot, you know that I hand pick a deck to use each season. The winter 2017 deck I hand selected was the Rota Tarot by Soror Tzadkiel because of its beautiful useage of sacred geometry and deep Qabalistic symbolism. I had a chance to catch up with Soror Tzadkiel and do an interview about the deck with her. 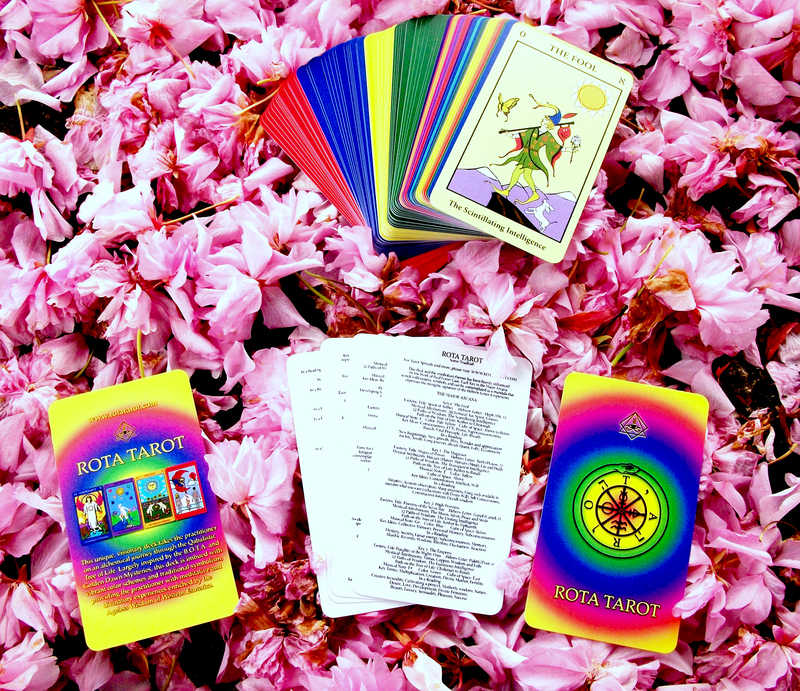 Anyone who is interested in Qabalistic Tarot should give the Rota Tarot a try. It truly is a mystical deck. Soror Tzadkiel has a deep, rich understanding of mystical Qabalah and what she shares in this interview is only a drop of what she teachers through her deck! Magdalena Tarot: What inspired the Rota Tarot deck? Soror Tzadkiel: I have been exposed to Tarot since I was a young child, as my mom always used the Rider-Waite deck. I can even remember seeing The Magician out on her bed when I was about 2 or 3 years old. I had always been intrigued by Tarot, and started divining regularly when I was gifted my first deck at the age of 17. In my late teens and early 20s (I’m 29 now), I set a goal for myself that I wanted to create my own Tarot deck. When I was 19 I acquired a copy of Israel Regardie’s “The Golden Dawn” and started learning about the Qabalah. This was in tandem with studying the traditional Kabballah under a Jewish Mystic, David Patterson, when I was studying Psychology and Judaic Studies at the University of Memphis. I was initiated into a Golden Dawn temple at the age of 24, and began diving deeper into the Qabalistic Tarot. When I was 25 I started studying the works of Paul Foster Case, the founder of the Builders of the Adytum Mystery School, which focused primarily on Tarot, Qabalah, and Alchemy as they are conveyed in the Western-Hermetic Tradition. I worked through many of his courses while participating in several Gnostic, Co-Freemasonic, and Qabalistic Mystery Schools in Canada. I understand that the most powerful magical tools are always those created by oneself, so I knew part of my initiation was to create my own deck. This was not part of a curriculum, but a self-motivated adventure. The visionary arts movement, the traditional Qabalistic Mysteries, and my will to instigate self-transformation were my primary inspirations for crafting this deck. I also yearned for a Qabalistic deck such as this so I could engage in the traditional symbols while working with the cards, and I could never find one! So I wanted to do a service to the world by creating something such as this. MT: How long did you work on the deck? ST:I had been gathering data for the deck since I was 17, and created the first cards in 2013. So, I worked on the art for the deck just over 3 years, but the research behind the deck took about 11 years. My studies at University of Memphis in traditional Jewish Kabbalah, my studies and practices in the various Hermetic Mystery Schools, as well experience with personal divination and ritual, all played key roles in the development of this deck. MT: What was the biggest challenge about creating a Tarot deck that’s all your own? ST: The biggest challenge was patience! It took a very long time to create everything, and I still find myself tweaking the designs. I also have very high standards of learning so it took me quite a long time to know enough about the Qabalistic Tarot for me to feel comfortable with presenting myself as a seasoned practitioner of the art. MT: The thing that stood out to me the most was your use of sacred geometry and the Hebrew at the top of the cards. Can you tell us a little bit about why you chose this style? ST: The Qabalistic Tarot is rooted in the Hebrew Mysteries (The Kabbalah), and the Western Hermetic teachings convey that each Tarot Key in the Major Arcana is a mandala expressing the wisdom teachings of the Hebrew Letter that it is correlated with. There are many teachings about each Hebrew Letter dating back to ancient oral traditions out of Israel, and so the pictures in Rota Tarot express that Ageless Wisdom. The Sacred Geometry woven throughout the deck also portrays primordial wisdom teachings pertaining to each card. This deck is holographic in nature. For example, The Fool has a 13 pointed Star in the upper right hand corner. If you notice, Death (the Key of Scorpio) is Key 13. You will take note that The Wheel of Fortune and The World each have the four fixed zodiac signs at the corners, and the Eagle, a symbol of Scorpio, is in the same position as the 13 rayed sun in The Fool. The Fool represents Uranus, and Uranus is Exalted in Scorpio, so there are many gems of meaning woven between the two Keys with regard to their Astrological connections. The entire deck has elements such as this! MT: I know this is a huge question that could include several books, but can you tell us a little about how you see mystical Qabalah relating to Tarot and how it enriches your experience as a Tarot reader? Qabalistic Tarot uses a cosmic language of symbolic imagery, and the deepest crevices of your consciousness understand this language fluidly. Working with the Qabalistic Tarot through study, practice, meditation, divination, and contemplation will evoke much thought, and invoke profound transformation in your life for the benefit of all living creatures everywhere. The Path of the Tarot is indeed a precious gift, and one that should be taken seriously by any aspirant that is called to this Work. I highly recommend reading Paul Foster Case’s Tarot: A Key to the Wisdom of the Ages, as he goes into detail about the rich meanings that reside in Qabalistic Tarot. Though not all of the symbols are verbatim, the basic meanings of the symbols listed in Case’s works are present in some capacity in the Major Keys of Rota Tarot. Each Key in the Major Arcana of Rota Tarot lists the title of the Key at the top of the card, along with the number and the Hebrew Letter attributed to the Key. The bottom of each Key lists the Intelligence as it is proclaimed in the ancient Kabbalistic text, The 32 Paths of Wisdom. Each Key in the Major Arcana has a specific color assigned to it, reflecting the Builders of the Adytum (B.O.T.A.) teachings on the Qabalistic Tarot. The practitioner is encouraged to explore the beauty in the mysteries of Tarot through placing out the Keys and unveiling patterns in them through meditation, contemplation, and intuitive exploration. To take the practice further, I recommend purchasing a blank B.O.T.A. deck, and painting the images of the Major Arcana as per Case’s instructions. The 22 Major Keys each correspond to one of the 22 sacred Hebrew Letters. They are comprised of 3 Elemental Keys (The Fool [Air, Uranus], The Hanged Man [Water, Neptune], and Judgement [Fire, Pluto]), 7 Planetary Keys (The Magician [Mercury], The High Priestess [The Moon], The Empress [Venus], The Wheel of Fortune [Jupiter], The Tower [Mars], The Sun [The Sun], and The World [Saturn]) and 12 Astrological Keys (The Emperor [Aries], The Hierophant [Taurus], The Lovers [Gemini], The Chariot [Cancer], Strength [Leo], The Hermit [Virgo], Justice [Libra], Death [Scorpio], Temperance [Sagittarius], The Devil [Capricorn], The Star [Aquarius], and The Moon [Pisces]). The Titles listed for the Minor Arcana, such as “Lord of Harmonious Change,” come from Book T, and were likely received by S.L. Macgregor Mathers and/or his partner, Moina Mathers, both of whom were Golden Dawn Initiates. The colorations of the Aces through Tens of the Minor Arcana utilize the colors (likely) channeled through Moina Mathers and/or S.L. Macgregor Mathers via scrying. For all of the cards in Rota Tarot’s Minor Arcana I have included the traditional Esoteric Titles from Book T, however, I have modified the titles displayed on the cards themselves for the Kings, Queens, and Knights, in accordance with inner guidance I have received. On my website I have listed the “Traditional Esoteric Titles” and the “Rota Tarot Esoteric Titles” for the Kings, Queens, and Knights. The borders of each card in the Minor Arcana reflect the Elemental color attributed to the Qabalistic World of each suit. Therefore Pentacles (Qabalistic world of Assiyah) are Green as a reference to the element of Earth, Swords (Qabalistic world of Yetzirah) are Yellow as a reference to the element of Air, Cups (Qabalistic world of Briah) are blue to represent the element of Water, and Wands (Qabalistic world of Atziluth) are red to represent the element of Fire. The Aces through Tens in the Minor Arcana are each titled at the top with the Hebrew name of the Sephirah they represent, and they are titled at the bottom with the Esoteric Title. The Court Cards are titled at the top with the Sacred Letter of the Tetragrammaton attributed to each of them, alluding to a deeper esoteric teaching imbued in the meaning. The Court Cards can be contemplated in tandem with the Major Arcana in order to unveil further insights about their ineffable nature. Therefore, The Emperor (Heh) can be contemplated with The Princesses and the Queens, The Hierophant (Vav) can be contemplated with the Knights, and The Hermit (Yod) can be contemplated with the Kings. The Hebrew titles of each Sephirah can be “opened up” by laying out the Major Arcana Keys so that they spell the word. You may then contemplate how the Major Arcana Keys tell a symbolic story that unveils deeper significance in each Hebrew word. Understanding the rich history of the Qabalah assists the practitioner in tapping the deep reservoirs of ancient symbolism underlying each Key. I will say that I think it is rare to find decks such as this since the market of Tarot and Oracle decks tend to take things in a direction rooted in artistic exploration, rather than integrating the traditional wisdom teachings as they have been put forth in the Mystery Schools through the ages. My goal was for Rota Tarot to integrate the Ageless Wisdom of Qabalah, Alchemy, and Astrology, so that each card was saturated with meaning. MT: How can the uniqueness of Rota Tarot enrich the reader’s experience when using the deck. ST: Through the dreamscape-like imagery, combined with the rich symbols inspired by the Hermetic Mystery Schools, I do believe that the images promote inner healing and balance for any practitioner. Because the imagery is so close that which is used in the B.O.T.A., and because I worked in that lineage of teachings, I do believe that the deck is a portal to the healing energies channeled through practitioners of that path. MT: Tell us a little bit about the release of the deck. How much will it cost and how can someone order a deck? 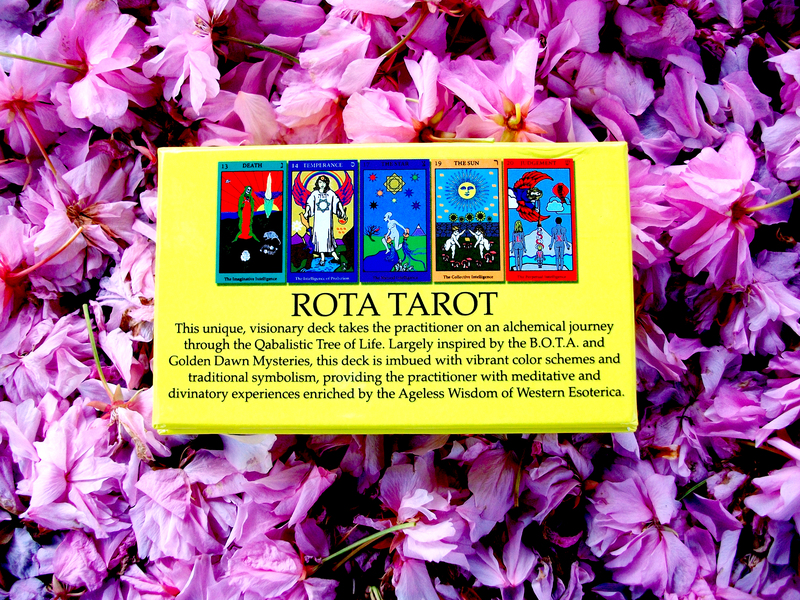 ST: I am very excited for the release of Rota Tarot! I have two versions of the deck available. One is a larger deck with a deluxe, sturdy cardboard box, with a top and bottom, and it includes an accordion booklet with pith meanings for each card. This one retails for $50 USD. I have just released a mini deck that includes the same pith meanings, though they are on extra cards that come with the deck, and that one retails for $22 USD. All decks are available through my etsy store. MT: Do you have any ideas for more Tarot related projects in the future? ST: I am working in an in-depth book that thoroughly explores the themes in each card! It may take a few years to complete. I have made quite a bit of headway on it, but there is still quite a lot to do! MT: How did being a visionary artist affect you while creating this deck? How does it affect you as a reader? ST: In my meditation practices, I am flooded with vistas of visionary images, and these visions have greatly inspired each Tarot Key, specifically those in the Major Arcana. In my time working through Paul Foster Cases courses, I spent weeks at a time meditating with each Key in the Major Arcana, and so the inner guidance I received, through intuitions and visions, greatly inspired each image in the deck. As a visionary artist, and a symbolist, when giving myself readings I am able to draw correlations between the various cards in a spread and unveil the deeper significance of what they mean together, and how it relates to my divinatory inquiry. MT: What’s one thing you have to say to all the Magdalena Tarot readers who have been enjoying your artwork over the past couple of months? Thank you for your support! May LVX be extended upon you, and may each of you continue to unveil the One Self through your Great Work! Blessings! This entry was posted in art, Astrology, mysticism, mythology, numerology, occult, Qabalah, Rota Tarot, self help, spirituality, Tarot, witchy, Writing and tagged abundance, art, astrology, divination, dreams, empowerment, inspirational, magick, manifestation, mantra, meditation, metaphysical, motivational, mysticism, numerology, occult, pagan, predictions, psychic, qabalah, self empowerment, self help, spiritual, spirituality, tarot, tarot reading, tarot weekly forecast, wicca, witchcraft, witchy, writing. Bookmark the permalink.